Always Available – Click here to buy! Ever wanted to design a wizard but been boggled by the rules or stumped by creative block? GURPS Wizards is the solution: a complete guide to wizard design. Inside you'll find essays on 28 wizard archetypes, accompanied by templates that let you quickly design complete and efficient characters. The role of each wizard is discussed, along with suggestions for integrating it into a campaign and specific advice on attributes, advantages, disadvantages, skills and spells. Wizards covers . . . 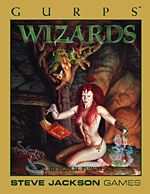 Traditional wizards, such as the apprentice, demon, elementalist, enchanter, healer, illusionist, necromancer and seer. Magic-using versions of the assassin, bodyguard, inventor, law enforcer, martial artist, spy, statesman, thief and warrior. Variant wizards, like the alchemist, druid, improvised magic user, knack wizard, priest, rune-mage and shaman. Wizards who don't use magic at all, including the charlatan, psi, ritual magician and super mage. Wizards also includes a template system that walks you through the process of creating guidelines that will help your players make capable and balanced characters. A special section on wizard templates discusses not just spells, but also the special abilities that appear in Cthulhupunk, Mage, Psionics, Religion, Supers and Voodoo. Other features include "quick" and "instant" alchemy, expanded rules for knacks and Magery, and notes on replacing spells with super powers, psi skills and ritual magic. Wizards offers players and GMs alike sound advice on creating viable and original characters. Each template also comes with 4 examples that cover multiple settings, TLs and power levels, giving you 112 complete sample characters from over a dozen genres that are ready to use as PCs or NPCs. Welcome to the Guild, apprentice . . .
GURPS Rogues – Everything you need to know about backstabbing, intrigue, and the seamy side of life, with 29 templates and over 100 sample characters for all kinds of settings. GURPS Warriors – 29 warrior archetypes, along with templates and design advice allowing you to quickly and efficiently recruit your new warrior. Warehouse 23 offers worldbooks, supplements, and adventures, in physical and digital formats, for GURPS – as well as many of our other game lines. Surf our site for the files you want . . . and get them instantly with a credit card or PayPal! See our GURPS Resources page for general GURPS tools.